A federal lawmaker in the Second Republic, Dr. Junaid Mohammed, tells The Punch's John Alechenu that the handling of the current crisis in the National Assembly will determine the fate of the country’s democracy. What do you make of the invasion of the National Assembly by operatives of the Department of State Services? From what we have heard so far, the Director-General of the State Security Services who was at the centre of it all hasn’t confirmed his loyalty either to the President, Acting President, or for that matter, to the Senate and other institutions of governance in this country. There are suggestions out there that he is acting in cahoots with Bukola Saraki. Well in Nigeria, nothing could be too surprising because there are quite a number of double agents in virtually every branch of government, in every ministry and every department and these are people who are for sale or have their own ambitions to service and they don’t care about the national interest. One has to be very careful about evaluating what actually happened, what was supposed to happen and what didn’t happen. While there was noise about locking down the Senate, there were people within and they were senators. Is it being suggested that these people went in and said lock us in? The question is, if there was an intention to lock everybody out, how come some people found their ways in and sat there? The story making the rounds is that some people decided they would come early in order to be part of the agenda of what they were going to do that morning. Whatever the theory being peddled about the incident what does it portend for our democracy? What happened was very unfortunate and whichever side you want to blame or give credit to, it has really reduced our country, our democracy to that of a banana republic and the fact that since the event happened, there has been no statement-except the one which came from the office of the Acting President, denying any involvement in what happened. Now, this Lawan Daura has been arrested and all the noise about searches being conducted in his house or houses either in Abuja or other places. What happened or did not happen to him is a story for another day. As far as I am concerned, the event itself has been a great disservice to this country and as I said, it has reduced us to the place of a banana republic which is very, very unfortunate. This democracy has cost us so much in terms of money, in terms of labour, in terms of political argumentation for it to be seen to be threatened this way by a gangster and a few of his service men holding huge Israeli guns, it is really unfortunate and it speaks volumes about the kind of government we are running and the kind of leadership we have. Since the event happened and the dismissal and arrest of Lawan Daura there has been no statement from Buhari himself, only guess work. There is also the spin that what (Yemi) Osinbajo did; he did it with the knowledge and blessings of Buhari. 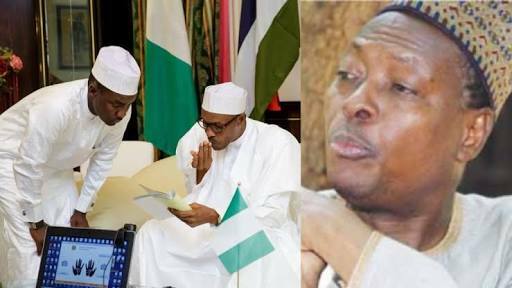 There is an ethnic attempt by those who are related to Buhari, who are from Daura, who must be related to Lawan Daura, who now want to travel to the United Kingdom to ask Buhari to reverse himself and virtually bring back Lawan Daura and then sack the National Security Adviser who was supposed to be Lawan Daura’s boss but who he never respected and who he was not even in speaking terms with. You can see that the whole thing now is becoming a typical Nigerian football game where everybody kicks it the way he likes. It is very unfortunate and it is more or less heading towards a climax of the kind of Presidency we chose for ourselves in 2015 and the kind of situation Nigeria now finds itself. It speaks volumes about the incompetence and the irresponsibility of this Presidency, the ruling party and the main opposition party and all seems to be a bloody mess. If you recall, like I told you before the elections and thereafter, that there is no difference between the ruling All Progressives Congress and the opposition, Peoples Democratic Party, which are in fact two sides of the same coin. This is now becoming absolutely clear. This kind of two-party system and close to one hundred others calling themselves political parties being registered by the Independent National Electoral Commission, will not serve our democracy well. We, as Nigerians, will have to start thinking about a way out. I have had occasions to talk to people in the media to say look, since this Saraki fellow sneaked into the Senate under the cover of darkness to cut a deal with the PDP, the Senate has known no peace. When you undermine the Senate, you essentially undermine the two chambers of the National Assembly. Why is it that every time anything concerns Bukola Saraki it becomes a crisis, why? Do you think the leadership style the new National Chairman of the APC, Adams Oshiomhole, has employed will bring about the cohesion the party is seeking to get before going into the 2019 elections? No. To the contrary, it will add to the existing confusion and acts of gangsterism and the use of uncouth language synonymous with the lifestyle of gangsters, he is bringing it into our political scene. What we had before he became national chairman of the party was already too much. Bringing Oshiomhole and making him chairman of the party, add that to the blunders of President Muhammadu Buhari and his presidency; simply means Nigeria and the political system should be ready to pay a high price. Nobody in his right senses will look at this fellow (Oshiomhole) and think he can be a political party leader who can maintain some harmony, some level-headed approach to sorting out problems. He has now become more or less the glorified National Publicity Secretary of the APC. In Nigeria, if you are the publicity secretary of a party, your job is to go and abuse everybody other than your own party and that is what he has been doing. Nobody for example, now knows that the APC has a publicity secretary other than him. He has been abusing other parties and their leaders and the others return the favour by abusing him, the government, the President and everything thereafter. I don’t believe Adams Oshiomhole has the qualities of a political party leader and that in addition to so many other blunders and display of bad faith by Buhari himself has further complicated matters. I would have thought that if you are a president of a country, you have a vested interest in the maintenance of peace and measure of civility in the political system. But this President seems to be the kind of person that encourages corrupt, abusive rogues and scoundrels to be the major players in the political system. This does the country no good; it doesn’t do the ruling party any good. Oshiomhole is now in the middle of this crisis. In fact, he is making his own reputation by the way he is behaving. I can assure you, he has a more hard-line posture than those people in the Senate that have a vested interest in their political careers than him because he is a spent force. Here in Nigeria if you mess up in a job, you get promoted to a higher job that is typical of the Buhari administration. The legislators have also had a cause to complain about the President’s slow response to national issues requiring urgency. Do you share their concerns? It takes a while to build a reputation. If somebody handles certain sensitive and strategic assignments badly, insensitively, corruptly and without due international interest, it will be expecting too much to think the same person under similar circumstances will come up with something better. Essentially, from 2015 to date, Buhari has been governing the country the only way he knows and you and I will agree that his best is not good enough for Nigeria. In a democracy, you don’t blame people for their electoral choices. You must have seen it in the news media that people are blaming President Donald Trump for every crisis the global economy is going through. It is the same problem we have since we chose Buhari as president without taking a look at his capacity and allowing his relatives and friends deliberately choosing to hide the truth about his health status physically and mentally from the rest of Nigeria, this is what we are reaping. To make matters worse, he is now determined to return for a second term to repeat the same thing. It took him six months to appoint a ministerial team what do we have? He promised to change his cabinet over one year ago, what has happened? This is the worse cabinet ever assembled in Nigeria since 1914.